Lesson #1: Enterprise 2.0 is going to happen in your organization with you or without you. 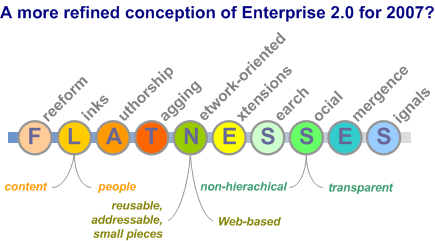 Lesson #2: Effective Enterprise 2.0 seems to involve more than just blogs and wikis. Lesson #3: Enterprise 2.0 is more a state of mind than a product you can purchase. Lesson #4: Most businesses still need to educate their workers on the techniques and best practices of Enterprise 2.0 and social media. Lesson #5: The benefits of Enterprise 2.0 can be dramatic, but only builds steadily over time. Lesson #6: Enterprise 2.0 doesn’t seem to put older IT systems out of business. Lesson #7: Your organization will begin to change in new ways because of Enterprise 2.0. Be ready.